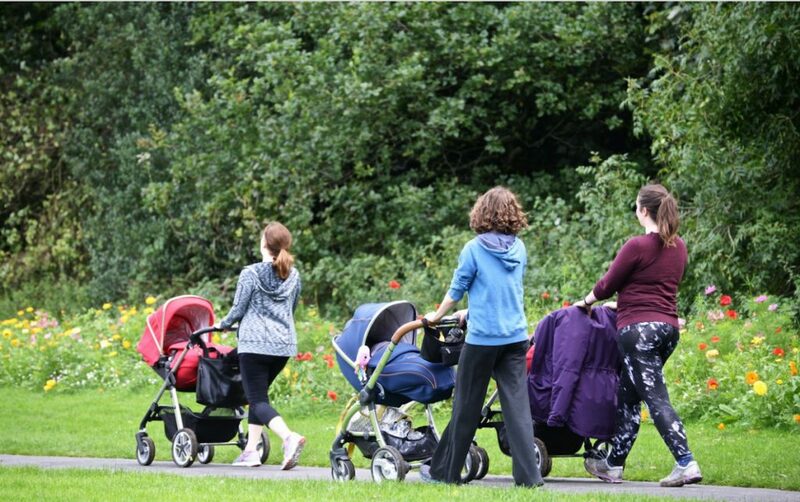 Bumps and Buggy Fit, the outdoor fitness class for pregnant women and new mothers with their babies returns to three parks in South Leeds thanks to support from Leeds Let’s Get Active. The free classes incorporate a walk in the park with basic fitness exercises. They will take place on Holbeck Moor on Mondays, in Middleton Park on a Tuesday in Cross Flatts Park on a Thursday and – the latter two sessions incorporate a visit to the park café. The classes are run by Sharon Wilkinson and Shelly Madden, specialist midwives and fitness instructors who developed antenatal exercise classes for Leeds Hospital Trust, before setting up their own not-for-profit company, Bumps and Babes. Alongside the exercise they are able to offer health tips around pregnancy and new borns, but perhaps most importantly the sessions bring women together who can then form their own friendships and support networks. Every Monday from 15 April 11:30am-12:30pm meet at the Skate Park. Every Tuesday from 16 April 1:30-2:30pm. Meet at the Leeds Urban Bike Park. Every Thursday from 18 April 1-2pm. Meet at the Bridge Café in the Watsonian Pavilion in Cross Flatts Park.